Tyler Lockett's three touchdowns helped the Wildcats end their five-game bowl losing streak with a 31-14 win over Michigan. 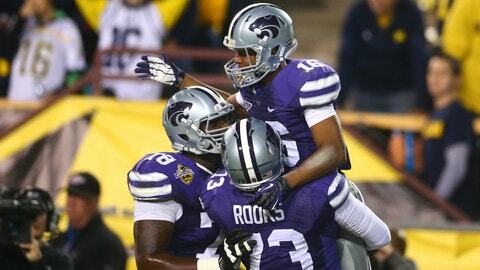 TEMPE, Ariz. Jake Waters threw for 271 yards and connected with Tyler Lockett on three touchdowns, leading Kansas State to its first bowl victory in 11 years, 31-14 over Michigan in the Buffalo Wild Wings Bowl on Saturday night. Kansas State (8-5) scored on its first three possessions, all touchdown passes from Waters to Lockett, and its defense dominated Michigan to end a five-game bowl losing streak. Lockett set a school record with 10 catches for 116 yards and Waters completed 21 of 27 passes, sending the Wildcats to their first bowl victory since the 2002 Holiday Bowl. Freshman Shane Morris was steady in place of injured starter Devin Gardner, leading Michigan (7-6) on two early scoring drives. The Wolverines settled for field goals on both and did little the rest of the way, finishing with 261 total yards. Morris threw for 196 yards on 24-of-38 passing with an interception before leading Michigan on a late scoring drive with the game out of reach. Kansas State finished the season strong after some early difficulties — starting with a home loss to FCS North Dakota State — winning five of its final six games while scoring at least 31 points in each. Michigan limped to the finish after a 5-0 start, losing five of its final seven games and Gardner along the way. The senior injured his toe in the regular-season finale against Ohio State and didn’t recover in time for the bowl game, leaving the Wolverines in the hands of Morris. That was good for Wile, who made one field goal all season, but not for Michigan since its defense couldn’t seem to stop the Wildcats — particularly the Waters-to-Lockett combination. Lockett set up the next drive with a 40-yard kickoff return and capped with a 29-yard touchdown catch, set up by Waters’ pump fake that gave him separation behind Michigan’s defense.